On Monday the 27th day of January 1969, a meeting of the Conservation Officers of the New Hampshire Fish and Game Department was held at the Belknap County Fish and Game Club at Lilly Pond in Gilford, New Hampshire. This meeting was called for the purpose of forming an Association. William Turner conducted the meeting and after a lengthy discussion it was decided by those present to form a Conservation Officer’s Association. Henry Willey made the motion to call this new Association the Conservation Officers Relief Association. Paul Tasker seconded that motion and CORA, as it would later become known as, was formed. The original slate of officers were: President – Mason Butterfield, Vice President – Arthur Muise, Secretary – William Turner, Treasurer – Steve Rollins. Article II of CORA’s bylaws declare, “the objects of this Association shall be to give all normal and material aid in its power to its members, to foster harmonious relations and to create better working conditions, and also to create a better understanding within the New Hampshire Fish and Game department by closer cooperation with all divisions, and through association and cooperation we may be better fitted to carry on our work for our common good and as public servants of our citizens.” One of the first tasks taken up by CORA was to get Conservation Officers into what was then know as the State Police Retirement System. These efforts paid off the following year. In addition to the above objects, CORA provides scholarship monies each year to the children of Conservation Officers and retired Conservation Officers through the Henry P. Mock Scholarship Fund. CORA has awarded several Honorary Lifetime Memberships since its inception in 1969. 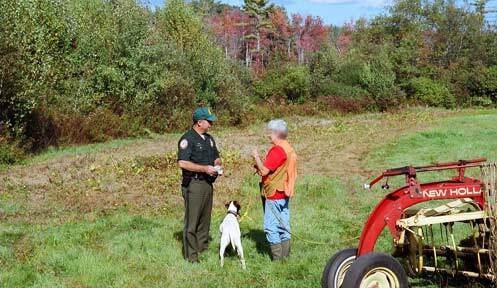 In addition to all retired Conservation Officers, some of the more notable ones include former New Hampshire. Fish and Game Director Ralph Carpenter, made Honorary Member in 1969; Governor Meldrim Thomson Jr., made Honorary member in 1976; and Attorney James Doherty, CORA’s first legal counsel, made Honorary Member in 1976.